Are Liberals Needlessly Freaking Over Sotomayor's Abortion Record? 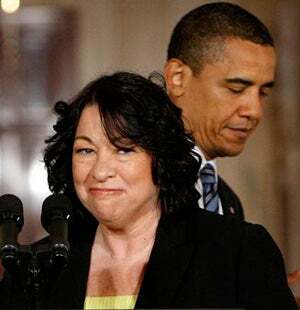 Yesterday, the Obama Administration had to reassure some committed pro-choice activists that Judge Sonia Sotomayor is not going to side with Justices Scalia, Alito and Roberts in overturning Roe v. Wade in some yet-to-be determined case. Jill Filipovic makes a good case for why we shouldn't be so worried. Pro-choice activists are, according to Lynn Harris on Broadsheet, worried about 3 specific rulings of Sotomayor's: Center for Reproductive Law and Policy v. Bush, in which she ruled that the global gag rule was Constitutional; Amnesty America v. Town of West Hartford, in which she ruled in favor of anti-abortion protesters; and Lin v. Gonzales, in which she ruled in favor of asylum for a Chinese woman because of China's enforcement of its one-child policy. But, for most pro-choice activists, the first case is the most concerning. The Center for Reproductive Law and Policy (CRLP) argued that the Gag Rule violated their First Amendment, Equal Protection and Due Process rights. On the First Amendment claim, CRLP argued that the Gag Rule prevented the organization from fully communicating with international non-governmental organizations; if non-U.S.-based NGOs worked with CRLP to advocate for abortion rights in their own countries, they would lose U.S. funding. Thus, the Gag Rule's speech-chilling effect prevented CRLP, a domestic organization, from carrying out their mission, thereby curtailing their freedoms of speech and association. CRLP also argued that the Gag Rule violated their Fifth Amendment Equal Protection rights by privileging anti-abortion views and putting the CRLP on unequal footing when it comes to domestic competition with anti-choice organizations, and violated CRLP's Due Process rights by, as Sotomayor summarized in her opinion, "failing to give clear notice of what speech and activities they prohibit and by encouraging arbitrary and discriminatory enforcement." In other words, the CRLP argued that by not allowing NGO's in other countries to work with CRLP to advocate for abortion rights abroad, the global gag rule violated CRLP's right to speak and associate in the United States. It further argued that, by allowing anti-abortion groups to work with and talk to NGO's abroad without risk to their funding, the government was violating their right to equal protection; and that, since the standard for what speech did and did not qualify international NGOs to lose their funding, the gag rule violated due process. "the Supreme Court has made clear that the government is free to favor the anti-abortion position over the pro-choice position, and can do so with public funds." If anything, CRLP v. Bush highlights precisely why Sotomayor should, in a sane world, be an easy confirmation: She sticks to the rule of law, respects precedent and writes thoughtful and reasoned opinions. She was nominated to the federal district court by George H.W. Bush. Her decisions are left-leaning insofar as she generally seeks to protect Constitutional rights by supporting religious freedom and free speech, and she often sides with the plaintiffs in discrimination cases - hardly "activist" material. While Filipovic disagrees with some of Sotomayor's decisions, stating "Sotomayor would not have been my first choice, primarily because my political leanings are far to the left of her legal theory," and a handful of other First and Fourth Amendment decisions she disagrees with Sotomayor about, she supports the nomination because of Sotomayor's overall legal philosophy. Right-wingers are going to oppose her nomination with full force - we would be foolish to do it for them. But when have liberals ever made things easy on ourselves?